Thomas Tuchel produced a masterclass as his team out-witted the Red Devils in their UEFA Champions League Round of 16 first leg clash. Few people expected Paris Saint Germain to put the performance they did and get a great result at Old Trafford in the absence of important players like Neymar, Edinson Cavani and Meunier who were out with injuries. Thomas Tuchel, however, proved to the world exactly why he’s one of the best managers in world football these days with a second-half turnaround after a cagey first half in comparison. Manchester United who have been on the road to rejuvenation ever since Ole Gunnar Solskjaer relieved Jose Mourinho of his duties were brutally outplayed and out dominated. Angel Di María had the last laugh against the United faithful who tried to boo him at every touch he got. He racked up two assists on the night - the first from a set-piece which Kimpembe diverted into the net after some pathetic defending from Matic at the far post, and the second when his square pass was finished off by Mbappe in a wonderful counter to kill off the game. Verratti was absolutely everywhere on the pitch and could as well have been a single man midfield. His opposite, Paul Pogba was sent off at the very death and this dismisses the chances of a turnaround in the second leg in Paris. Manchester United started with a 4-3-3 on the night. A front three of Martial, Marcus Rashford and Lingard led the lines for United. They were supported by Paul Pogba and Ander Herrera in midfield with Nemanja Matic playing the role of a pivot. Bailly and Lindelof formed the defensive duo and Ashley Young and Luke Shaw were the fullbacks on the night. United defended with a 4-1-3-2 with Matic just ahead of the 4-man defence and Pogba, Herrera and Lingard forming the second line of pressure and zone of ball retrieval in midfield. Thomas Tuchel started with a surprising lineup and formation that looked like a hybrid between 5-3-1-2 and 3-4-2-1. The use of Dani Alves appeared to be a right winger on paper when the official lineups were first posted but he played the role of a wingback in what can be called a 5-man midfield and drifted in between attacking and defensive overloads flawlessly. Mbappe led the lines supported by Angel di Maria and Julian Draxler on either flank. Behind them, Marco Verratti was a one-man midfield maestro and Marquinhos played the role of a pivot wonderfully well despite being a natural centre back. Juan Bernat and Dani Alves offered width on the flanks and Thiago Silva, Kehrer and Kimpembe lined up at the heart of the defence. PSG played with a 3 man defence when going forward and casually shifted to a back 5 whenever off the ball and defending. 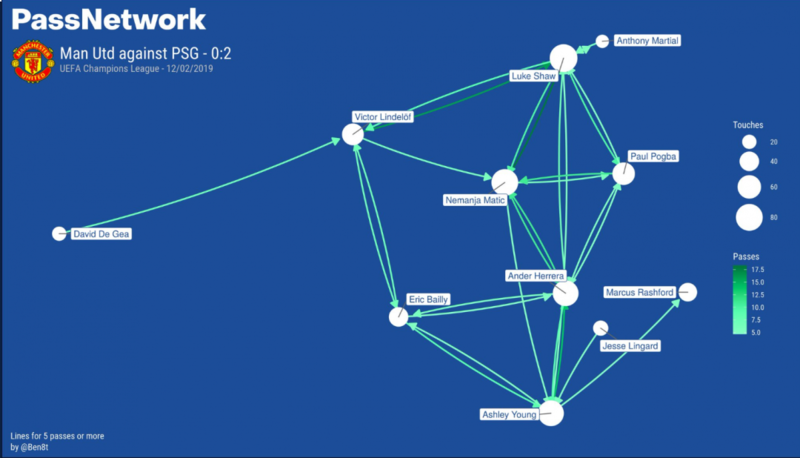 In the very first outset, PSG started the game by trying to play out from the back in typical Tuchel fashion. Buffon looked uncomfortable in the initial few exchanges and gave away the ball cheaply on a few occasions. United’s pressure was intense in the first few minutes and they converged in threes and fours with one man triggering the press on the PSG player with the ball and the other three trying to cut off passing lanes. 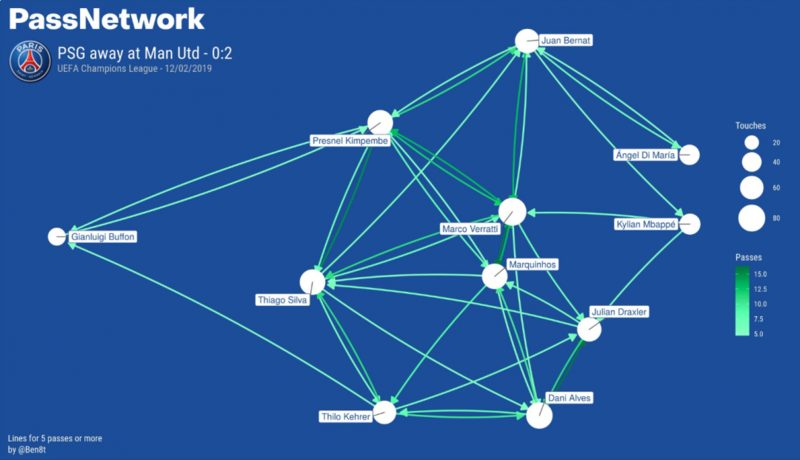 In the absence of a natural number 9, both sides looked to penetrate into the final third with wing play and United especially resorted to a lot of crosses. Both sides were locked in a defensive overload and counters looked like the best strategy to unlock the game. Manchester United were quick in transition but their attacks fell flat in the final third and a couple of wrongly timed layoffs ruined two counter-attack opportunities. 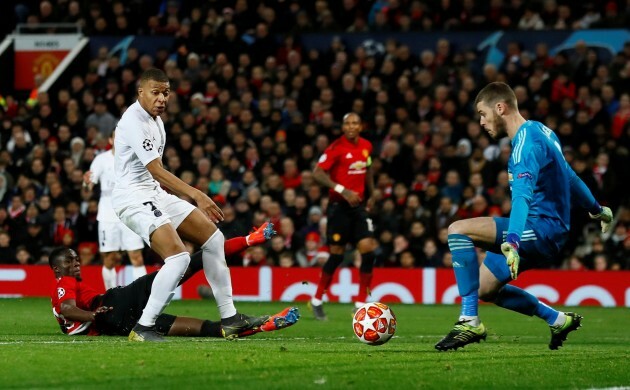 With a clear lack of penetration in the final third of the pitch, PSG could be accused of being too respectful of Manchester United and not daring to take risks despite being in control of the game more than their opponents in the first half. Jesse Lingard and Anthony Martial had to be taken off at half-time due to both sustaining injuries on the just before half-time. This set back United’s hopes of taking a proactive approach in the second half. Lingard and Martial were the keys to pressing high and the threat on the counter. Alexis Sánchez and Juan Mata came on in like-to-like subs. With Alexis’ slump and the lack of pace and intensity in Mata’s game because of age, United lost the press trigger high up the pitch, the consistent engaging of opposition fullbacks and the chances of countering PSG with speed and accuracy. At half-time, Thomas Tuchel that the issue with his side was in their attitude in the first half- being too cautious of Manchester United. In the second half, he gave his players more freedom to pressure more intensely and to combine more quickly and readily in the final third in order to create chances. He asked Di Maria and Julian Draxler to tuck in more centrally as compared to the first half. This allowed Dani Alves and Juan Bernat more space to create a wing overload of 5 players and the United defence that defended narrow with Luke Shaw and Ashley Young were caught in blizzards. The floodgates opened because of some poor defending from United on a set-piece. Nemanja Matić who was supposed to mark Presnel Kimpembe was caught ball-watching as Kimpembe tucked in a Di Maria corner at the far post. 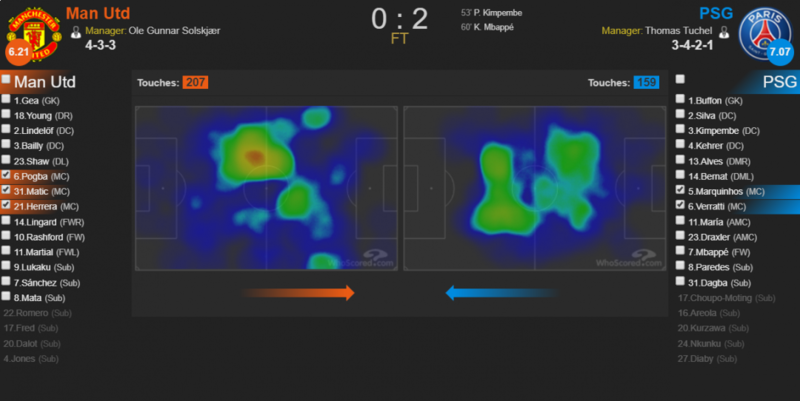 Thomas Tuchel blocked Paul Pogba out of the game by not allowing him time and space in the areas where he can be dangerous from in the centre of midfield with his use of Marco Verratti and Marquinhos. Verratti was absolutely stupendous with his performance on the night- he was literally everywhere, creating chances, orchestrating possession, dictating the tempo, retrieving balls in the final third as well as the defensive third and blocking counter-attacking opportunities from United. Marquinhos provided him with more than an able supporting cast, snuffing out danger at every occasion. The pass lines exchanged between Verratti and Marquinhos from the pass map above clearly indicates how much they enjoyed their fair share of possession at the centre of park trying to dictate the rhythm and tempo of the game. For the second goal, Ashley Young was caught out of position in no man’s land. This generated ample space for Di Maria to run into and reach the final third with a textbook counter. He played a simple and precise 5-yard square pass to Kylian Mbappe who made a tremendous burst of pace to get behind Victor Lindelof and Eric Bailly and finished it off promptly. Manchester United’s players’ heads dropped after this point and they had no replies to the questions United asked from them for the rest of the game. Trying to get a goal back, they looked very frustrated and reckless in their challenges and attempts at winning the ball back. One such incident saw Pogba being sent off after receiving a second yellow card in the game. It was mighty impressive how Thomas Tuchel had such a wonderful masterclass in the away leg in the absence of star men Neymar and Cavani. He used the first half cautiously in order to assess the threats and dangers that this United side red hot in form under Ole possess and used that to his advantage in the second half like a game of chess. He played his cards right asking his wingers to tuck in so that his fullbacks could stretch the play and creating the numerical superiority at the centre of the park by nullifying United midfielders.